This month I was lucky enough to be sent Quinteassential Tea to review despite not being able to attend their event earlier this year. I spoke to a lovely brand representative who allowed me to pick one of their teas to try out. I’ve only recently gotten into drinking tea so I was super stoked to be trying something a little different. When I had a look at their website at the range of teas available it took me forever to decide on just one because they all looked so interesting! 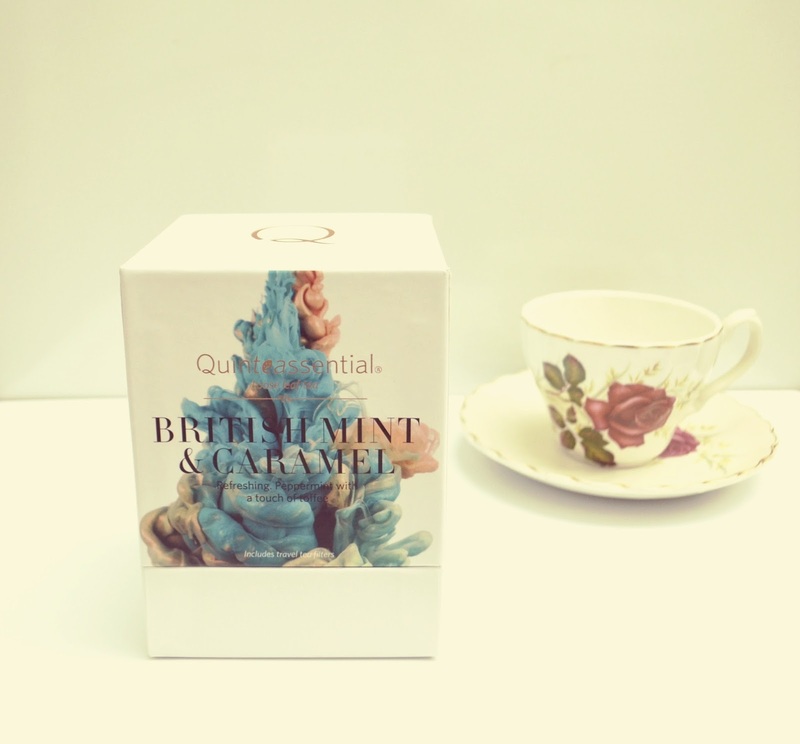 In the end I opted for British Mint & Caramel tea, as my recent trips to Morocco and Turkey had got me hooked on mint tea and I had never thought of pairing it with caramel. The packaging it came in was stunning. Honestly, I was happy enough just staring at the box! Inside the box, there was a generous packet of loose tea, teabags that I could fill with tea and stirrers. It all looked really well thought out and I was loving it even before I’d tried the tea out. I had been so busy sorting out my clothes for a wedding that I didn’t get to try the tea until last week. I had some friends over for dinner and once we were done stuffing our faces and were sat around nursing our food babies, I decided to brew some of the tea. I followed the instructions and used one teaspoon per cup, boiled the kettle fully and let it brew for 5 minutes. I used the loose tea in a saucepan but you can add a teaspoon into the tea bag’s provided and let the bag sit in your cup for a while. Either way it’s really easy to make a cup and I could already see by the colour and aroma that the tea was of great quality. The tea tasted mostly of mint tea initially which we’re all big fans of, but as we drank some more the sweet taste of caramel kicked in. I only had one friend who doesn’t drink hot drinks who had passed on a cup, but when she heard all the praise for it she poured herself a cup and let’s just say she’s found her new favourite beverage! I love that the tea is caffeine free, which means it makes a perfect night cap for the winter evenings, especially after a long day and heavy meal. The tea feels light to drink but is full of flavour. All in all, it’s pretty evident just how great quality the tea is. 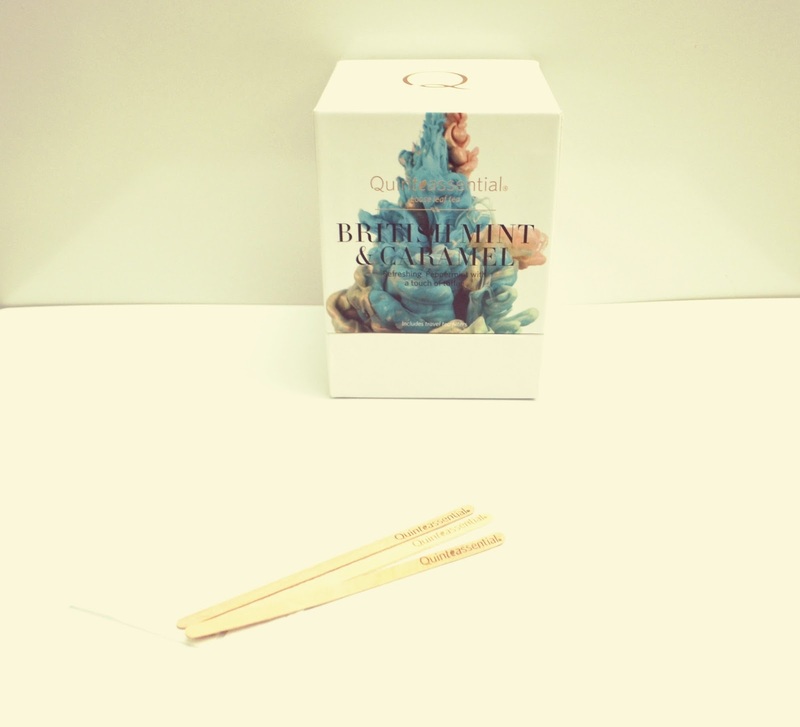 The taste is lovely and I’m really keen to try some of the other flavours that are offered by Quinteassential Teas. Are you a fan of mint tea?